"A Simple Question Yields Many Profound Answers." "Quinn and Temaner are filmmakers and “inquiring reporters” with great insight, and a lot to tell us about ourselves.”"
They meet a lonely girl, a happy mother, young lovers, hippie musicians, a sociologist, and even the actor Lincoln Perry, better known as the infamous Stepin Fetchit. Each interview is a complete and thoughtful piece of the person’s life, with no intercutting. The humor and sadness of these honest encounters lift the film beyond its experimental conceit into a serious and moving inquiry into contemporary society and the circumstances under which people examine their lives. 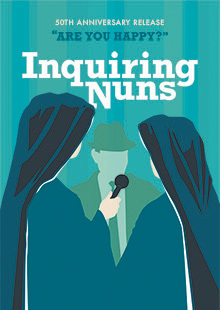 One of the earliest examples of Kartemquin co-founders Gordon Quinn and Gerald Temaner’s exploration into the world of cinéma vérité, Inquiring Nuns captures the attitudes, fears, and dreams of everyday Chicagoans, giving audiences and researchers insight into the political and social climate of 1960’s Chicago. The film’s music is composed by Philip Glass in his first credited film score.